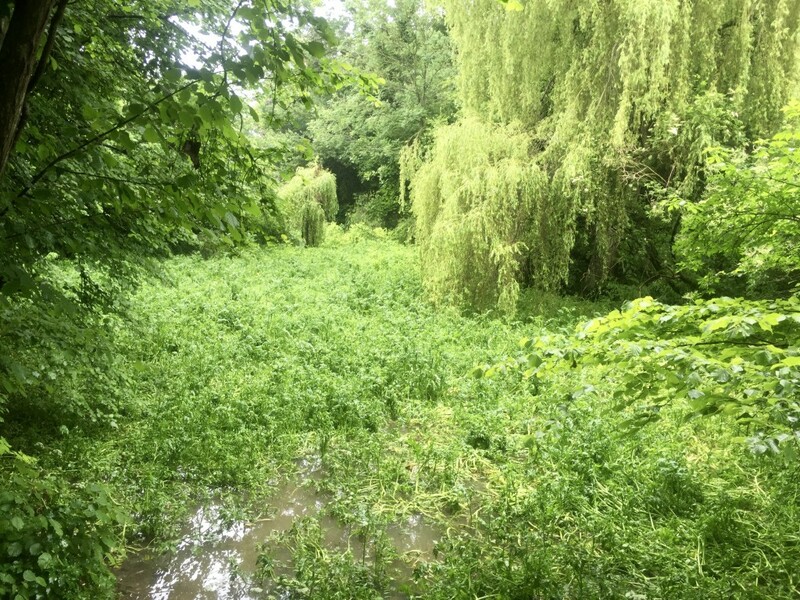 It was probably the worst day of the summer to attempt to walk along the Itchen Way – the long-distance footpath that follows the route of the River Itchen for around 30 miles from Southampton to Hinton Ampner, between Petersfield and Winchester. There was also morning-rush-hour chaos due to floods and fallen trees. 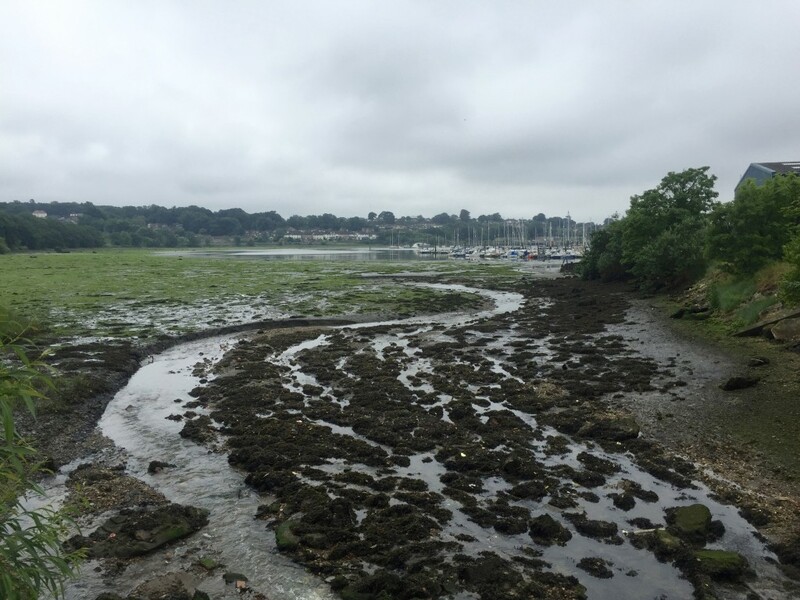 And, when I finally got to Bursledon to catch the train to my start point at Sholing, a foot or so of dirty water stood between me and the train station. I ended up having to backtrack on foot and find another route through a myriad of village footpaths and cul-de-sacs. I made the train, just. It was incredibly humid, too. I was dripping with sweat before I’d even started. Plus there was a forecast of more lightning in the afternoon. I was already wondering where I’d take shelter if a storm did come overhead. 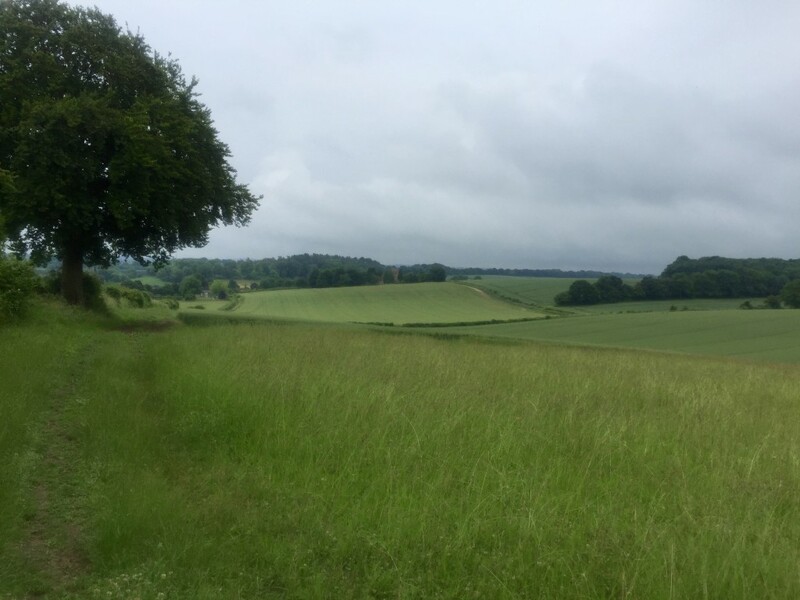 Yep, definitely not ideal conditions and preparations for a 30-mile ramble and not what I expected when I planned this midsummer walk a few months ago. Things got worse when I got off the train at Sholing station. The walk was supposed to take me down to the mouth of the Itchen through Mayfield Park. 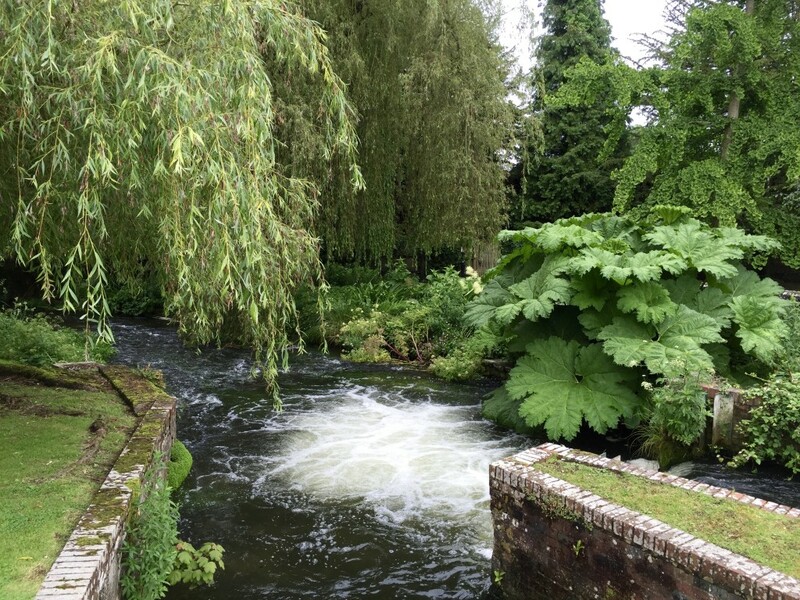 But, the stream that runs from nearby Millers Pond had burst its banks. Most of the water had ended up spilling onto the road under the railway bridge and gangs of school kids were milling around, their route to school blocked. As I thought about what to do myself, I spotted what looked like a Koi Carp swimming in the torrent. At least someone was enjoying it. So it was back up the hill to the station on yet another detour. 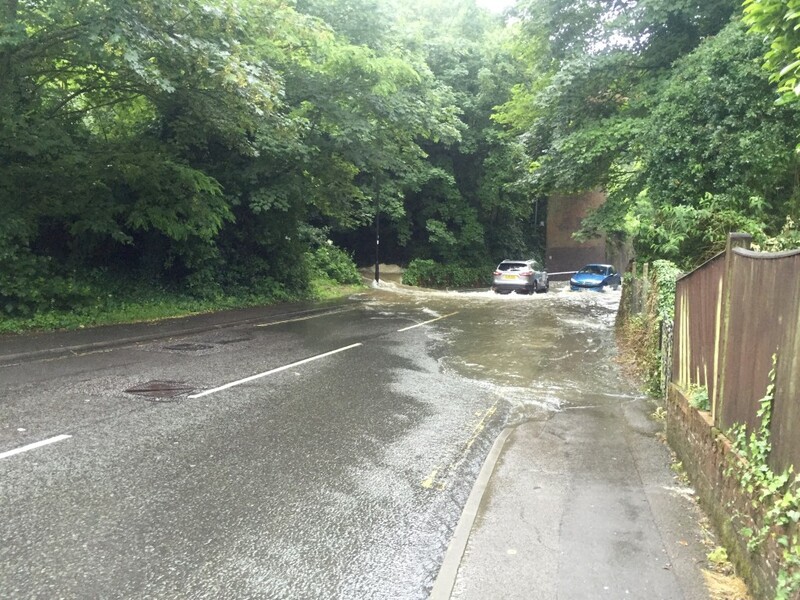 Fortunately I was able to get down to the mouth of the Itchen through residential streets without further incident. Much of this first stage of the walk is through residential areas anyway. I went through Woolston along Victoria Street and its hotchpotch of independent cafes, 99p stores, bookies and newsagents. 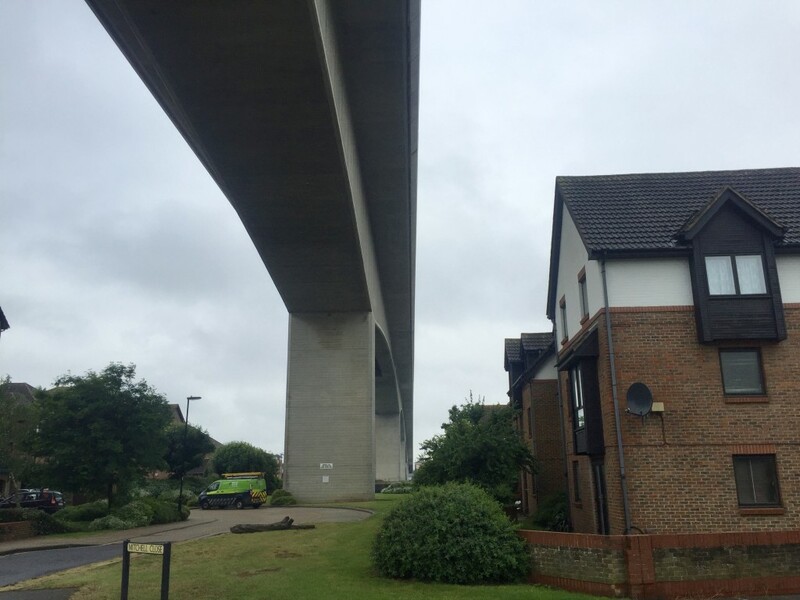 Then along Hazel Road under the spans of the towering Itchen Bridge, which connects Woolston with the city centre. This was the location of Woolston’s Supermarine factory, where engineers designed and built the Spitfire fighter plane in the 1930s. This made Hazel Road a target for German bombs in the Second World War. On one night in September 1940, more than a hundred people where killed in just one brutal air raid on the site. About half way along Hazel Road I climbed inland to Peartree Green – an open space with great views across the river into the city. From there it was through yet more quiet residential roads into Bitterne Manor. 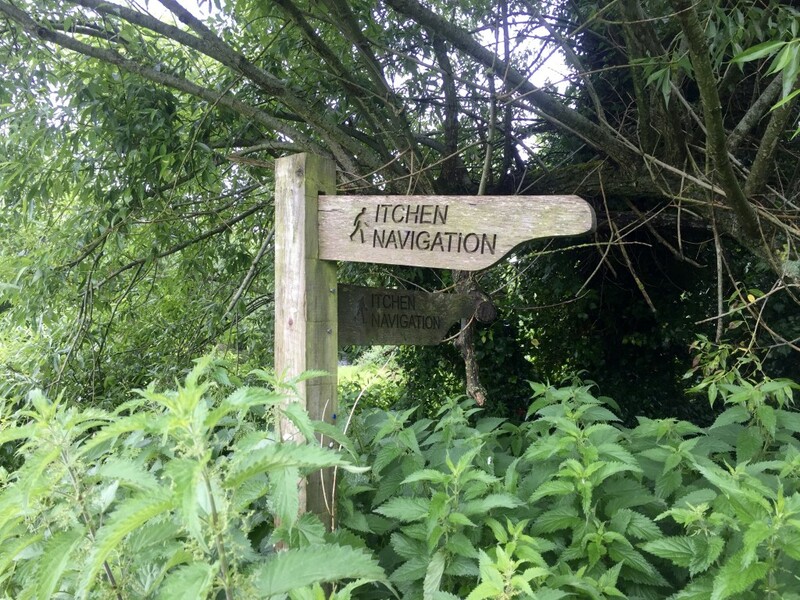 To follow the dog-leg of the river, the Itchen Way takes a twisting route here past the gates of the former manor house and through a maze of roads. I stubbornly stuck to the official path despite knowing I could lop off a mile or so by heading straight to Bitterne Park. There’s finally some greenery at Bitterne Park because the Itchen Way goes through Riverside Park. However, I continued along more house-lined streets so I could make a beeline for the toilet facilities at the end of Manor Farm Road without going too far out of my way. The tidal section of the River Itchen ends at Woodmill lock, about two-thirds of the way through Riverside Park. The lock itself isn’t there anymore. 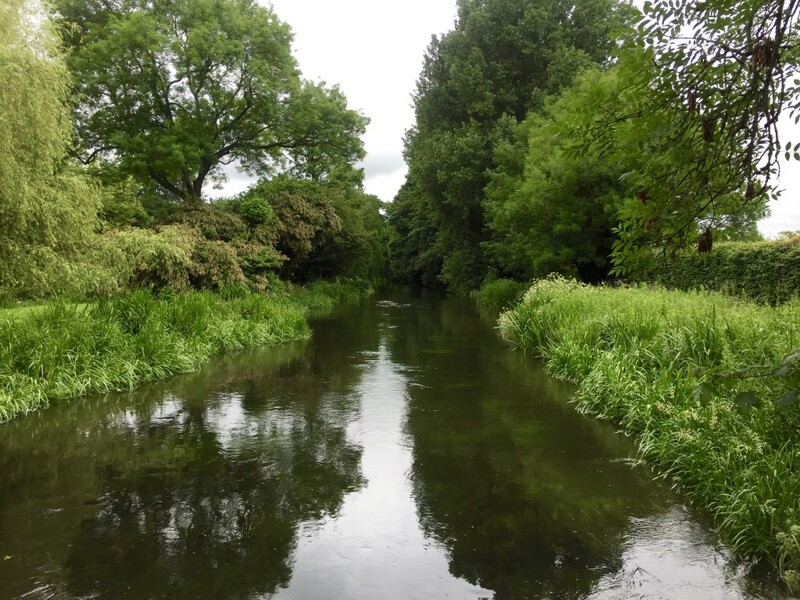 The Itchen is a chalk stream, perfect for watercress and trout fishing, so it usually resembles liquid glass beyond Woodmill. Today, after the previous hours’ heavy rain, it was brown and full to bursting. 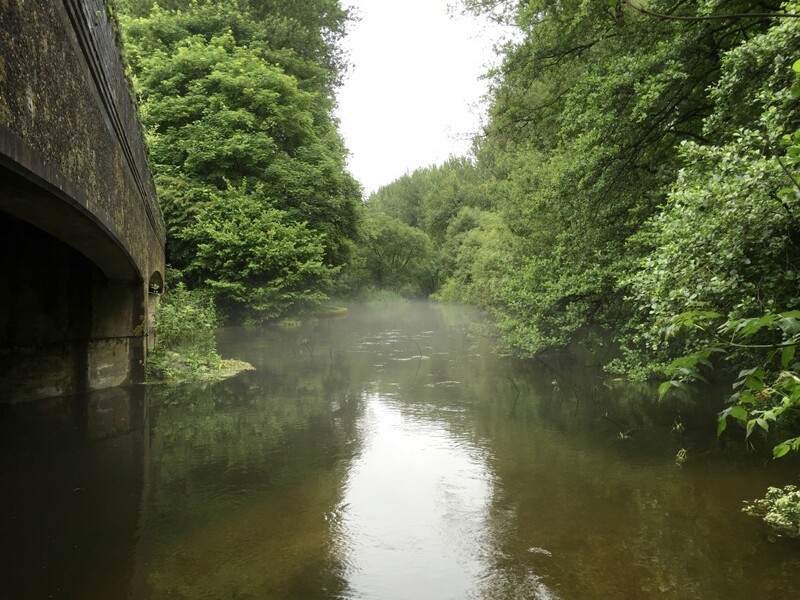 At the 19th century bridge at Mansbridge, I lost sight of the river because the Itchen Way picks up the towpath of the disused Itchen Navigation canal. It follows this pretty much all the way to Winchester. 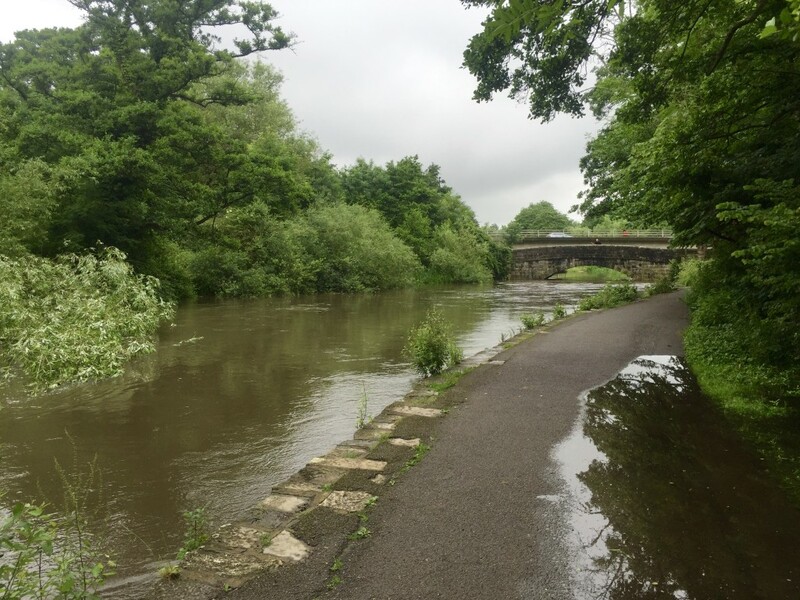 There isn’t much left of the canal here – just a few permanent puddles and the brickwork of some of the locks, which volunteers have tidied up and labeled with neat plaques. Go back a couple hundred years though and this junction would have been a hive of activity with barges transporting farming produce, timber, chalk and coal negotiating the locks on their journeys to and from Winchester. The arrival of the London and Southampton Railway in 1840 signalled the demise of the navigation. And with the motorway ploughing over the route in the late 70s, there’s little chance of it being fully restored. 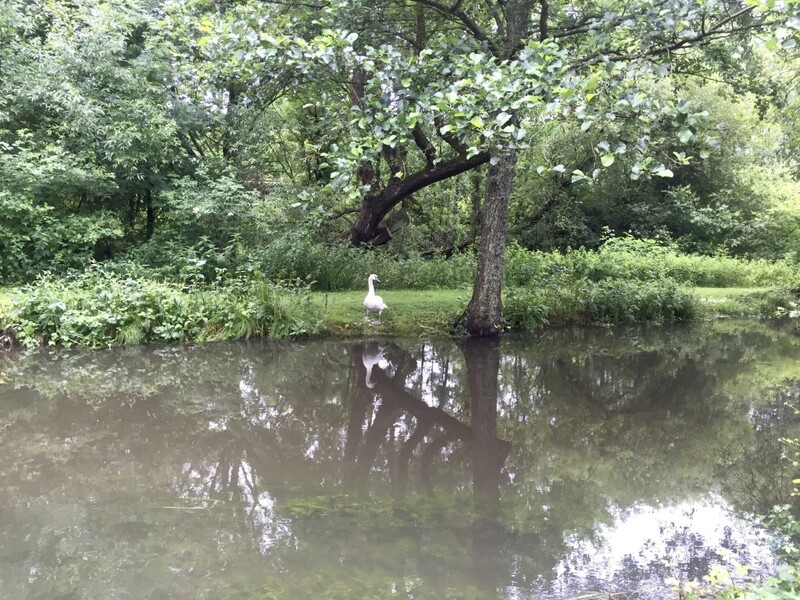 However, the Itchen Navigation Project has sought to repair the towpath and protect wildlife along the length of the canal. Without schemes like this, it’s likely that the path would be inaccessible. When I was planning this walk, I thought the start of the journey through Southampton would be the least interesting. Not so. Despite being out of the city, I found this stretch from Mansbridge towards Bishopstoke boring. Apart from the odd glimpse of the empty meadows of Itchen Valley Country Park through the trees, there wasn’t much to look at. It was eerie too, the stillness only broken by the odd plane taking off or landing at Southampton Airport, which was out of sight on the other side of the navigation. I felt less alone as I passed under the Eastleigh-Portsmouth railway line near Bishopstoke. 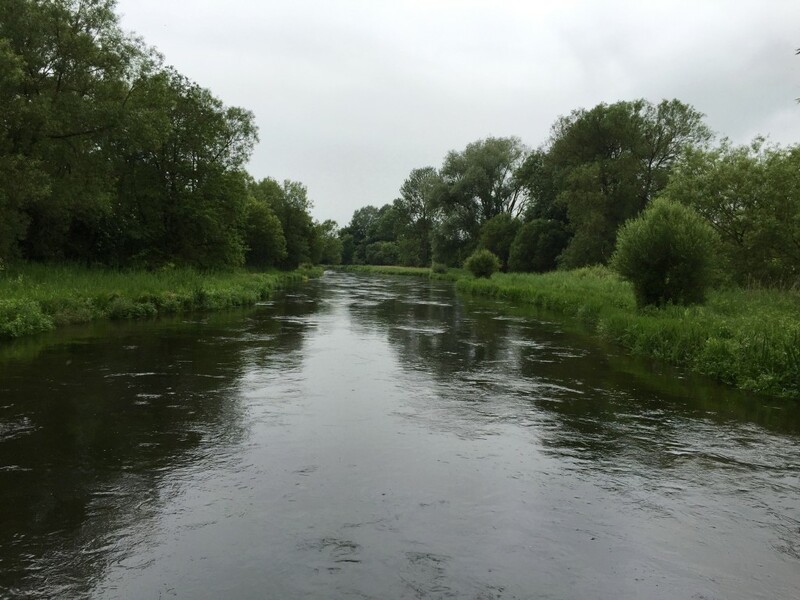 But, as the route rejoined the river for a short stretch, discomfort returned in the form of shoulder-high vegetation – mostly wet grass and stinging nettles – which crisscrossed the path. 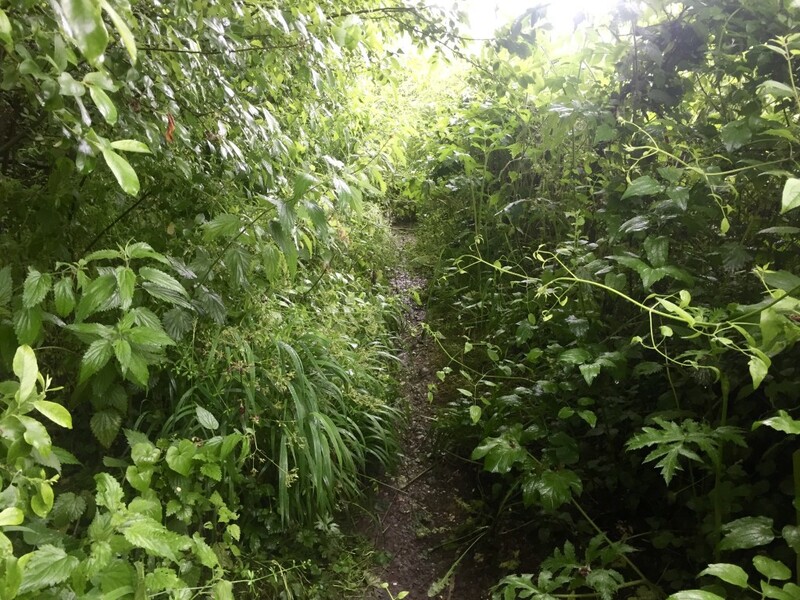 By the time I got to Bishopstoke, I was soaked through and covered in nettle rash. Unlike the dried-up first section from Mansbridge, the navigation is flowing at this point. 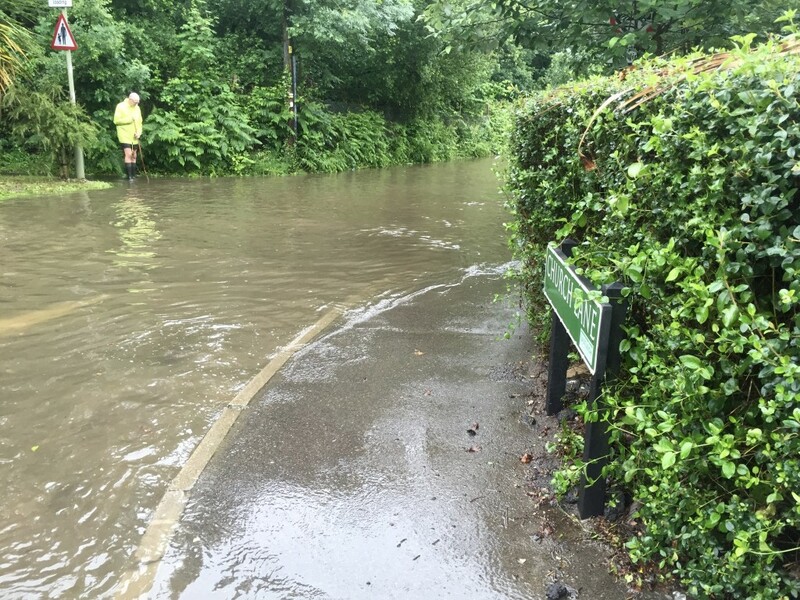 And, due to last night’s downpour, it had burst over the path to flood nearby fields. 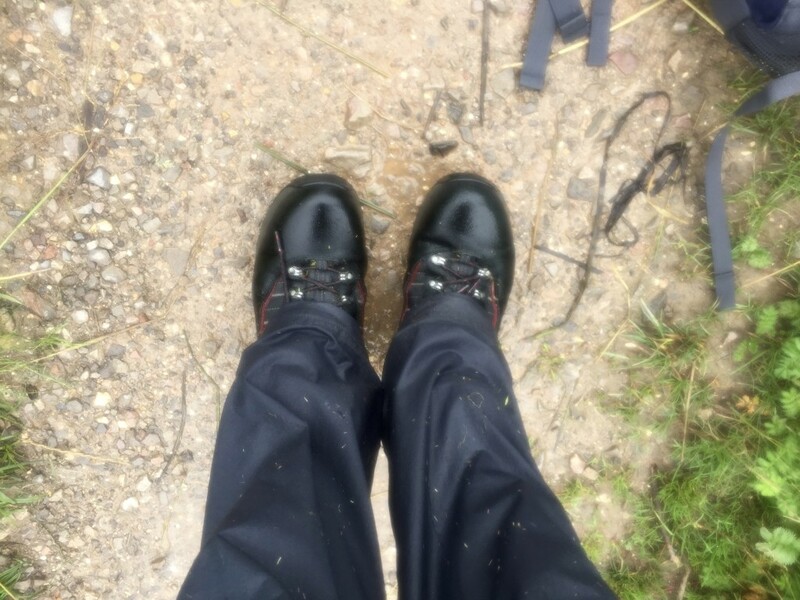 My feet were already sodden from my ramble through the grass. Yet I still had to think twice before wading through the burst sections – my waterproof boots weren’t going to keep my feet dry in half a foot of fast-moving water. Now, with loud squelches emanating from my boots every time I took a step, I was seriously contemplating giving up and saving this walk for another day. 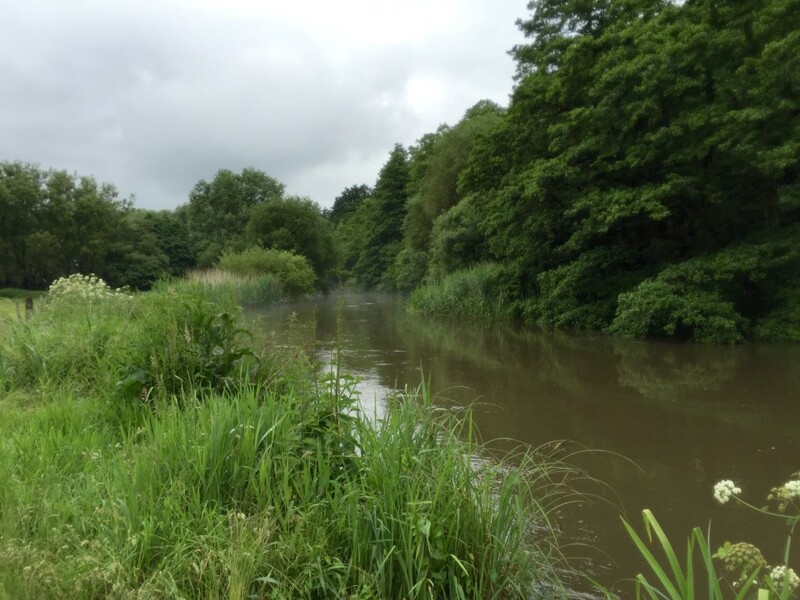 I decided to try to make it to Winchester – another seven miles upstream – and take stock there. After briefly joining the main channel of the river again north of Bishopstoke, the navigation and its towpath arcs up towards Allbrook. From there it passes the edge of the small village of Brambridge and then leads up to Shawford. Although the water on my boots and socks made my feet heavy, I enjoyed this section. The occasional clattering of a train from the adjacent railway line and the distant hum of the M3 were the only manmade noises competing with nature’s sounds. There was no wind either and the stillness definitely had a “calm before the storm” feel about it. How long before the storm would move in? The railway bridge in the centre of Shawford is where Victor Meldrew met his demise in a car accident in the last episode of “One Foot in the Grave”. 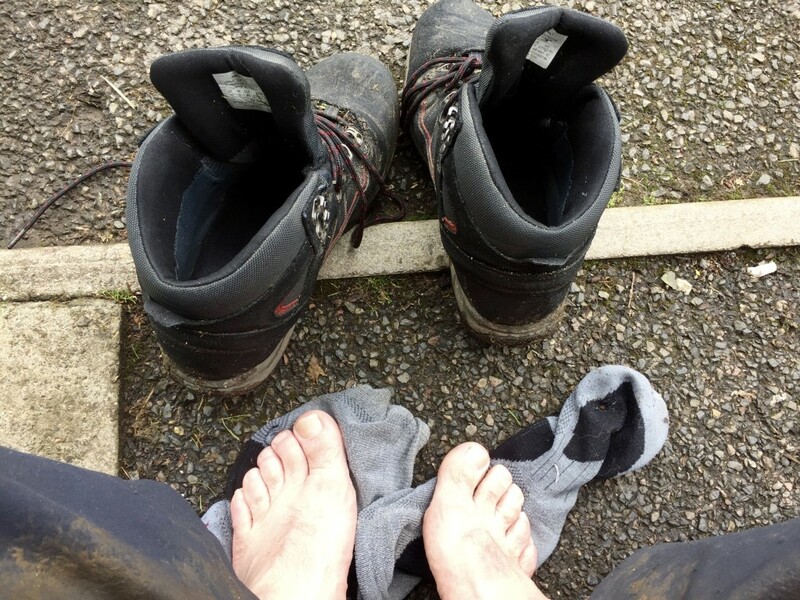 I was feeling slightly more alive by now though, especially after I’d taken my boots off and wrung the water out of my socks. 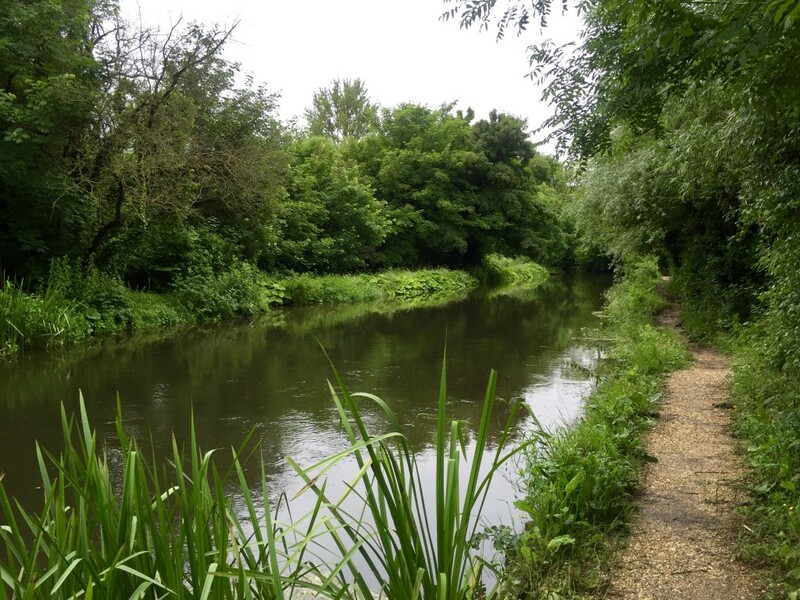 The Itchen Way continues along the navigation after Shawford alongside the Twyford Meads water meadows. Until the 1930s, farmers used a complicated system of sluices and hatches to flood the fields at specific times of the year. This stopped the ground freezing in winter and allowed them to harvest two hay crops a year rather than the usual single crop. Today, a few cows were grazing in the vast meadow. After the meads I passed under the motorway near Hockley Viaduct to pick up the Viaduct Way. This runs past St Catherine’s Hill – an ancient hill fort – into Winchester where the Itchen Navigation ends at Blackbridge Wharf. Before the arrival of the M3 in 1995, the busy Winchester by-pass spreaded fumes and traffic noise through this peaceful route. The Didcot, Newbury and Southampton Railway, which closed in 1964, also ran along here on its way to Chesil station in Winchester. 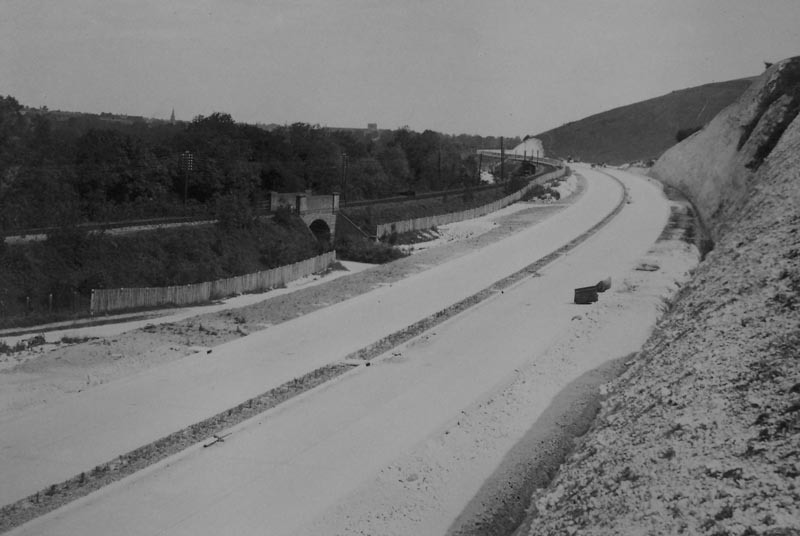 When the M3 tore through Twyford Down on the other side of St Catherine’s Hill, one of the upshots was that the by-pass – tarmac, signs, crash barriers and all – was removed and the cuttings filled in. Now it’s a hard-surface path popular with walkers, joggers and cyclists with excellent views over to the Hospital of St Cross. 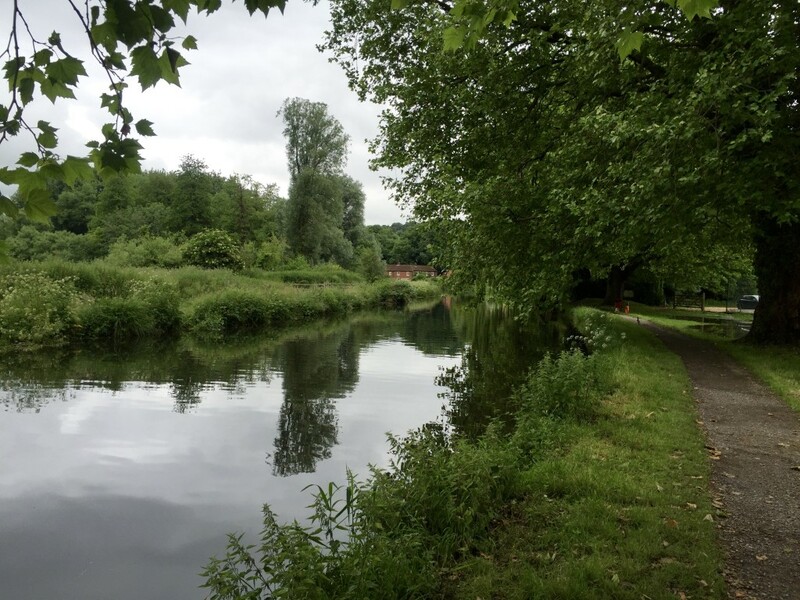 After crossing Garnier Road, the route passes under the weeping willows of one of Winchester College’s playing fields and then along the bottom of Wharf Hill to “The Weirs”, a popular spot for locals and tourists along a fast-moving channel of the river. Here, I grabbed a sandwich and changed my sopping socks. A group of German tourists, here to see the sights of the city, didn’t give me a second look as I sat barefoot, drying my feet. Keen to cover as much ground as possible before the lightning moved in, I didn’t hang around too long. And after a brief detour past the imposing bronze statue of King Alfred at the bottom of The Broadway to stock up with more water, I was back on my way safe in the knowledge that I’d passed the halfway point. Following a short stretch of road walking the route darts back into the fields near the edge of the city at Winnal. There was some more vegetation here, but not on the scale I experienced earlier at Bishopstoke. 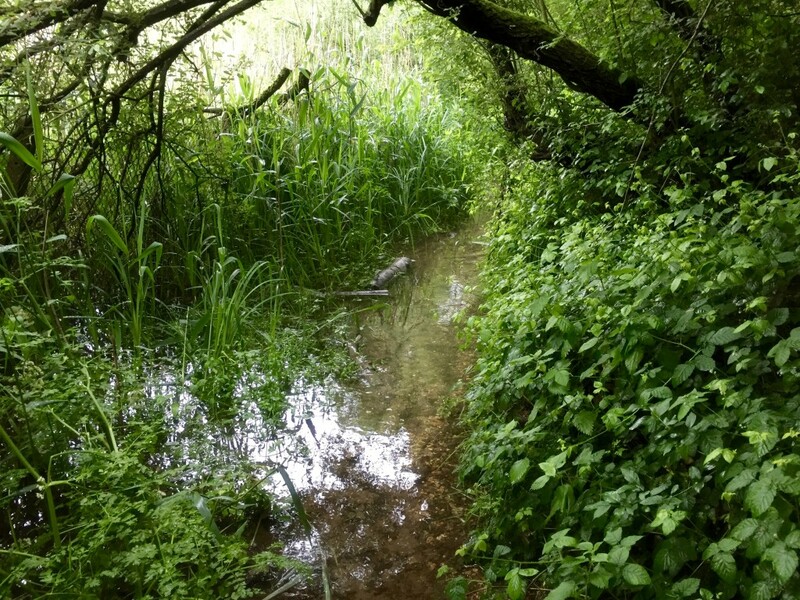 However, I soon hit upon another obstacle – the path was flooded again. And with the busy A34, which I was just about to pass under, on one side and marshland on the other I had no option but to wade through it. My new pair of socks stayed dry for less than an hour. The Itchen Way splits in two for a few miles after it passes under the A34. Keen to finish the walk before the weather worsened, I opted for the slightly shorter southerly route. This joins up with the northerly route again after a few miles. From this point, there’s not much riverside walking on the Itchen Way. Rather the path follows the route of the river loosely, crisscrossing it several times. At least there was less chance of flooding now. I soon entered the village of Easton where I passed its handsome 12th century church and then walked by the open windows of the village’s Chestnut Horse pub. With drizzle now falling, the chatter and smells from the pub almost enticed me in for a pint by the fire. The two paths of the Itchen Way rejoin again at Martyr Worthy. 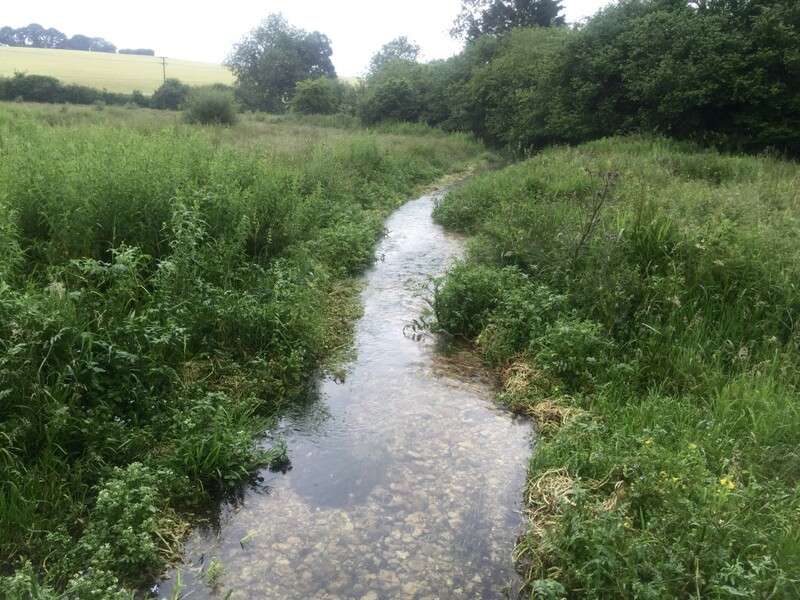 I then walked through several meadows on the north side of the river until I bridged it again at Itchen Abbas. From there it was past the gates of the stately home at Avington Park and around the edge of Avington Park Golf Club to Ovington, just outside New Alresford. A mile or so before Ovington the Itchen Way again splits in two and again I took the shorter route along a country road named Lovington Lane. Surprisingly for a path that follows the route of a river, it’s rather hilly around Ovington. There’s a ridge to climb just outside the village, made worse today by my fatigue and yet more long grass causing me to lift my feet up to avoid tripping. 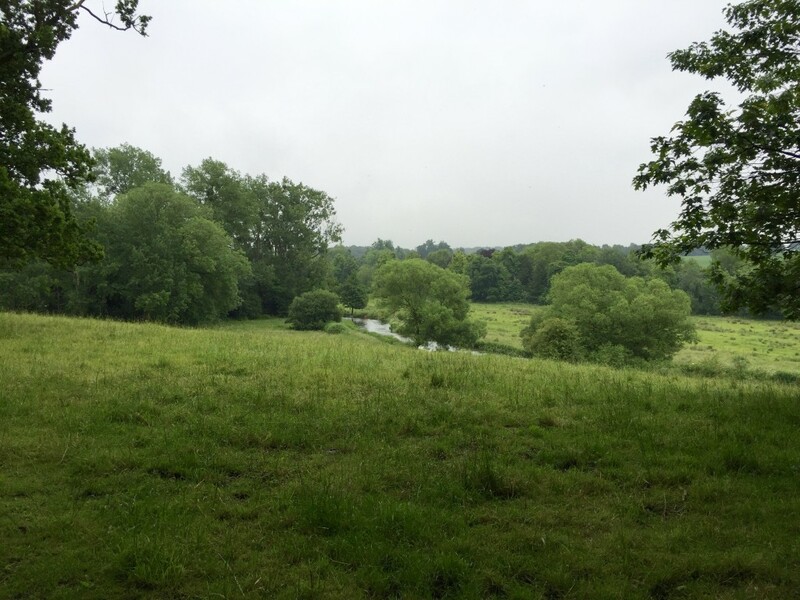 Thankfully, there’s an energising view into the valley where River Alre joins the Itchen at the top of the hill. Not really! With the skies getting blacker by the second and my legs aching, I took the most direct route. Like much of this northern section of the walk, there wasn’t much sight of the river itself. That’s until the final mile or so into Cheriton, where the path runs alongside the water in a sheltered valley. 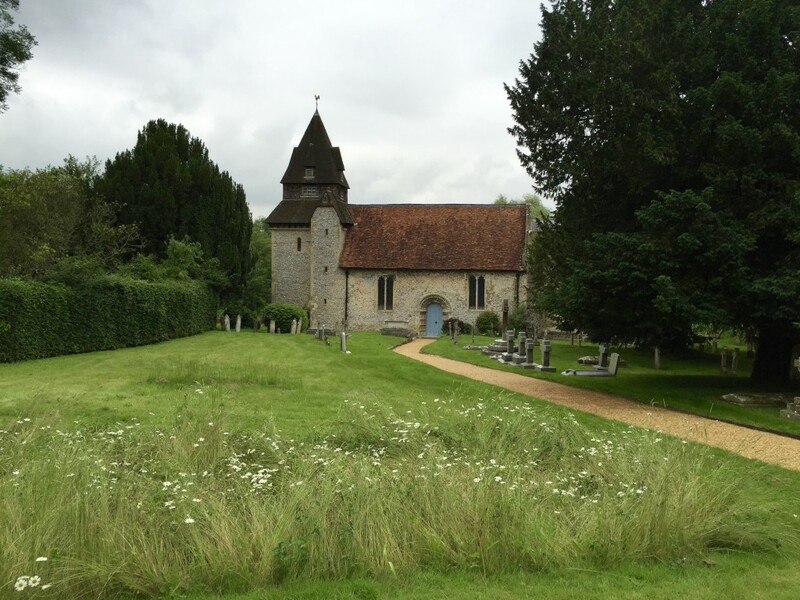 When I reached Cheriton, I walked through the churchyard and into the main part of the village. The river springs are only about a mile from here and the mighty estuary I walked along just a few hours ago is now just a shallow stream. Unfortunately for my aching muscles, there was a sting in the tail of this walk. 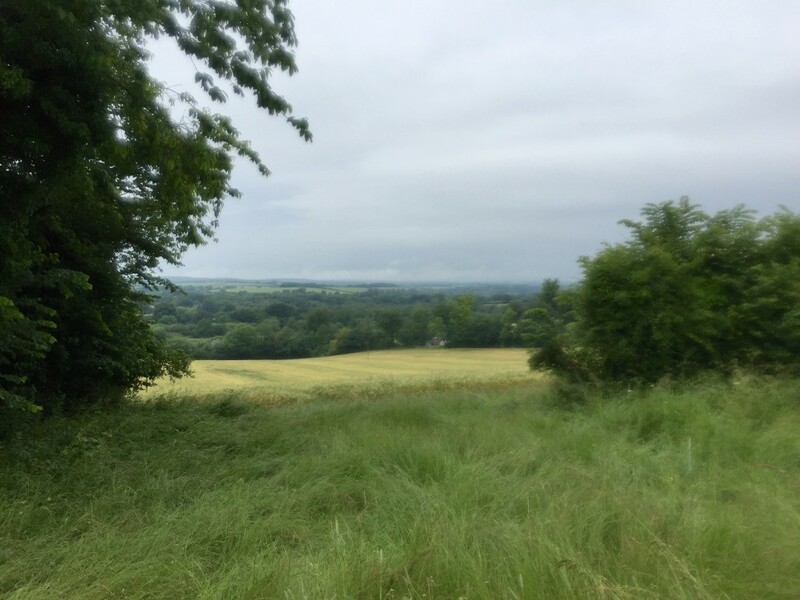 Instead of taking the most direct route along a busyish B road, the Itchen Way climbs another hill towards the site of the 1644 Battle of Cheriton before it takes you back down into “New” Cheriton. I was on the home straight when I reached the A272. About a quarter of a mile up the road to Kilmiston is a narrow copse of trees. Inside is the main spring of the river in a sunken glade brimming with pond weed. And that was that. Eight hours and 25 minutes and almost 30 miles (29.56 to be precise) later, I’d conquered the Itchen. I paused briefly to reflect on the last few hours. Then, with thunder rumbling in the distance, I decided it was time for a pint. Just one problem: the pub at Hinton Ampner was shut. So I sat on a bench outside in the rain to wait for my lift home. After the day I’d had, a little more moisture couldn’t hurt. 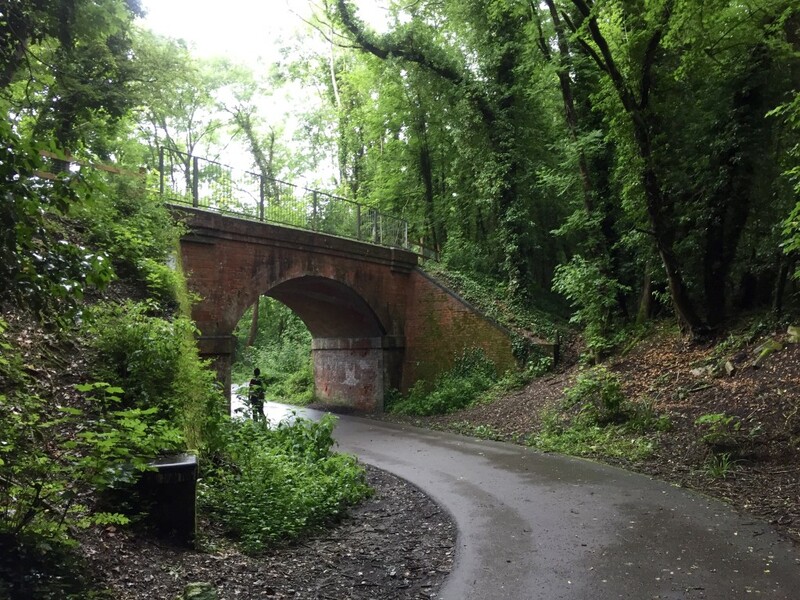 Info: The Itchen Way runs from Hinton Ampner to Sholing railway station in Southampton. It’s not clear exactly where the route begins and ends, but its waymarked along most of the route. It’s best to have a map handy – the Ordnance Survey’s OL32 and OL22 maps cover the north and south sections of the route respectively. Sholing train station is on the Portsmouth-Southampton line, with trains typically calling at Sholing every hour. The 67 bus, which runs from Winchester to Petersfield calls at New Cheriton near the river’s springs. Buses are hourly on weekdays and every three hours on Saturdays. There’s no service on Sundays.